If you’ve seen my Facebook or Twitter feeds, then you’ve seen me sharing quite a bit about the events in Ferguson, MO. What is happening there is troubling, heartbreaking, but not at all surprising, especially if you understand how we got here. But I’ve become aware that a lot of people genuinely don’t know how we got here. I think I can help a bit with that. But at the same time, I feel compelled to add my voice to the chorus highlighting the very real problems we have in our society. I had lunch with Christena Cleveland earlier this summer (Christena is one of the important voices we need to listen to in all this, click here to read her blog, and click here because you need to read her book too). I said to her almost exactly what Hugh said on Facebook yesterday and her response struck me and has really stayed with me. She told me to speak up, to use my privilege for good, not to let my desire to give deference to lull me into a silence which can be misconstrued as complacence. It will take a lot of voices speaking a lot of truth to move things forward. One of the great things about this moment is that there is no limit to who can speak or write. Adding my voice doesn’t have to detract or take away from others. My voice can amplify others. So I’m starting a new series to contribute what I can to the ongoing conversations we need to be having. I am not going to dwell too much on the specific facts of the Mike Brown case in Ferguson. There are a lot of places offering good coverage (Twitter and Slate are the sources that have been most helpful for me). Instead, I am going to blog my way through three important documents. I keep telling everyone I can to read all three of these but I get the feeling most people never do. The first, Dr. King’s “Letter From a Birmingham Jail” is a classic text and one that still speaks quite directly into our present situation. Dr. King wrote the letter responding to criticisms a group of white ministers have offered in a newspaper op-ed. I think I have heard every one of those misguided criticisms in the past week with regard to Ferguson. After I work slowly through Dr. King’s responses, I’m going to blog chapter-by-chapter through William Stuntz’s The Collapse of American Criminal Justice and Thomas Piketty’s Capital in the Twenty-First Century. I still recommend reading all these for yourself, but for those who can’t (or won’t), I will try to sum up the gist of the arguments made with an eye toward how we move forward. And perhaps serendipitously, the first argument those white ministers made against Dr. King was that he had no business in Birmingham, that he needed to stay in Atlanta and mind his own business, that the last thing they needed were “outside agitators” coming in and causing trouble. I have heard the same phrase, ‘outside agitators,’ to describe protesters and even media who have traveled to Ferguson in the past week. I have seen Facebook friends complain (maybe about me) about all the postings in their feed about Ferguson. And underneath it all is this (mostly unspoken) sentiment that white people like me have no business going on about issues affecting the ‘black community.’ I know this is not at all what Hugh meant, but even the idea that ‘other’ voices need to take the lead includes the inherent idea of separation. That there is somewhere outside and somewhere inside and only insiders should be dealing. 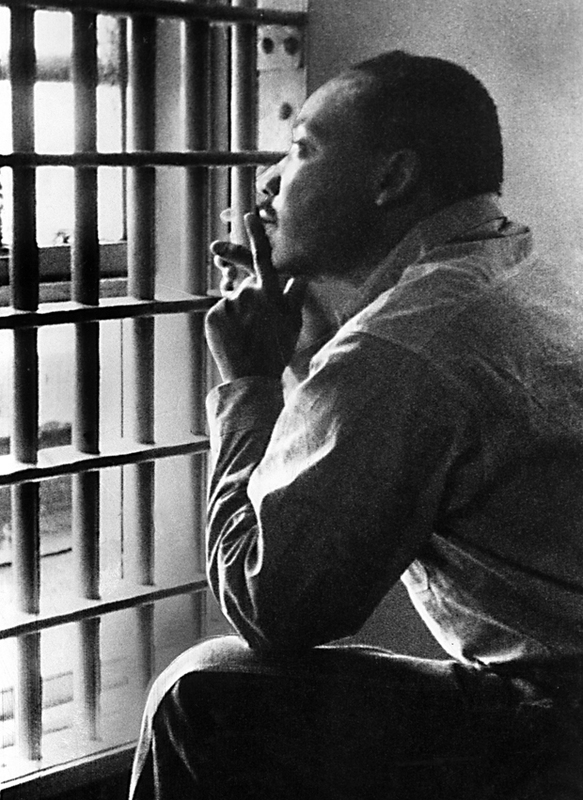 Dr. King began his letter by responding to this idea of being an ‘outsider.’ He rejected the argument that what was happening in Birmingham only affected Birmingham. He rejected the argument that he was an outsider or could be an outsider anywhere in the United States. We will see later on that he specifically laments the lack of white people speaking up about injustice, so though he doesn’t link ‘outsider’ with racial identifications at the outset, I think this is a fair extension of his argument. Dr. King was not an outsider to Birmingham and none of us are outsiders to Ferguson. And white people are not outsiders to the concerns of black people. None of us are outsiders because, “injustice anywhere is a threat to justice everywhere.” If Mike Brown can be gunned down for jaywalking, then any amount of violence can be committed by the state against any of us (if you don’t believe me, watch this video of a young man in Greensboro arrested for walking in the non-sidewalked street in front of his own home and this video of Wake Forest police repeatedly shocking a young man with a taser for cussing in public). None of us are outsiders because we exist in a “network of mutuality,” in other words, what affects one of us affects all of us either directly or indirectly. The same underlying causes of the protests in Ferguson are present in all of our communities: urban, suburban, exurban, rural. If you think your neighborhood is safe from injustice and violence, if you think a gate can protect your community, you are desperately mistaken. The very fabric of society, the existence of justice, the protection of life are at stake. Our justice system is broken. Our economic system is broken. There is nowhere ‘outside’ you can stand unaffected by these realities. You have to pay attention. You have to educate yourself. You have to be involved. You have to speak out. You have to support those fighting for justice. You have to pray. Your very life is as much at stake as much as anyone’s. “I am in Birmingham because injustice is here. Just as the prophets of the eighth century B.C. left their villages and carried their “thus saith the Lord” far beyond the boundaries of their home towns, and just as the Apostle Paul left his village of Tarsus and carried the gospel of Jesus Christ to the far corners of the Greco-Roman world, so am I compelled to carry the gospel of freedom beyond my own home town. Like Paul, I must constantly respond to the Macedonian call for aid.